Memory Lab @ Woodbridge Library – Make It! Create It! Learn It! The era of tapes, film and slides is winding down, but that doesn’t mean the memories of your home movies and photo albums should be forgotten. Bring your home videos, slides and photographs back to life by transferring them into digital formats that can be easily saved and shared with friends and family. 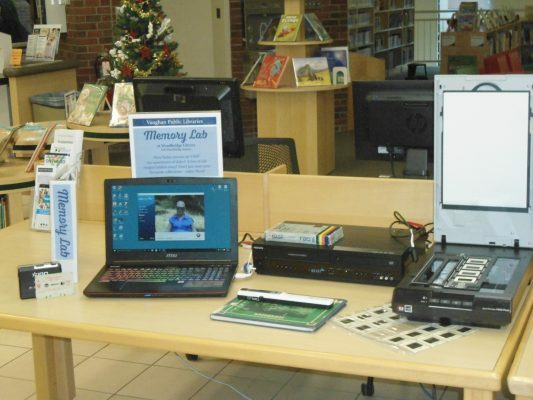 Thanks to funding provided by the Government of Ontario Woodbridge Library is proud to offer digital preservation and transfer equipment, along with the necessary instruction to bring life and use to all of your cherished memories. Turn photos, film and slides into high resolution files to be enlarged and restored. Capture analog video to a computer or mobile device. Easily transfer cassette tapes into digital files. The Memory Lab is available at Woodbridge Library to all library members on a first come first served basis, no reservations necessary. Digital files can be burned to a disc, saved to a USB key or external hard drive or uploaded to an online file sharing site. Customers are asked to bring their own media for saving on. For more information contact Woodbridge Library at 905-653-READ (7323) or speak to staff at the Service Desk.